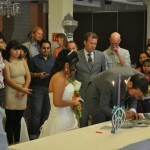 Interfaith marriages are on the rise. But despite their popularity, children are still only taught to marry within their faith. And when they do otherwise, interfaith couples struggle to balance each other’s beliefs and maintain a stable marriage. To fill in the gaps, many support programs sponsored by international Jewish organisations have sprung up. Rather than alienate interfaith couples and families, they provide resources to develop a better understanding of both religions and bring couples closer. Yesterday, the New York Times published an article on “finding common ground in interfaith marriage.” They highlighted a program in particular Honeymoon Israel. Based in Buffalo, the organization offers interfaith partners, as well as homosexual couples, subsidized 10-day trips to Israel. The trip allows them to connect with other couples in similar situations, whilst exploring Jewish culture and traditions. The couples are grouped by 20, stay in top hotels by the Mediterranean, and visit historic Jewish, Christian and Muslim sites in Israel. Another organization highlighted in the NY Times article was InterfaithFamily, a non-profit based off the website, interfaithfamily.com. It helps interfaith couples who have difficulty finding a rabbi to officiate at their wedding by providing them with one.